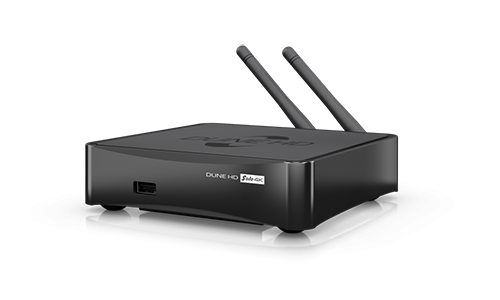 Dune HD Solo 4K is the most universal solution for playback of 4K and FullHD video, high-quality audio, IPTV and VOD content, digital TV channels. Supporting most digital audio and video formats, including the most modern HEVC video codec with support of 1 billion of colors (10-bit color encoding), all modern 3D video standards such as MVC, Side-by-Side and Top-and-Bottom, audiophile HD audio with high resolution up to 24-bit /192 KHz, Dune HD Solo 4K sets an entirely new standard. Dune HD Solo 4K is equipped with two USB ports, an internal 2.5” SATA HDD bay, 1Gbit Ethernet, 802.11ac Dual Band 2T2R Wi-Fi.